The working group “Transformations in the World System – Comparative Studies of Development” suggests devoting its sessions at the General Conference to the rise of new periphery in the world. 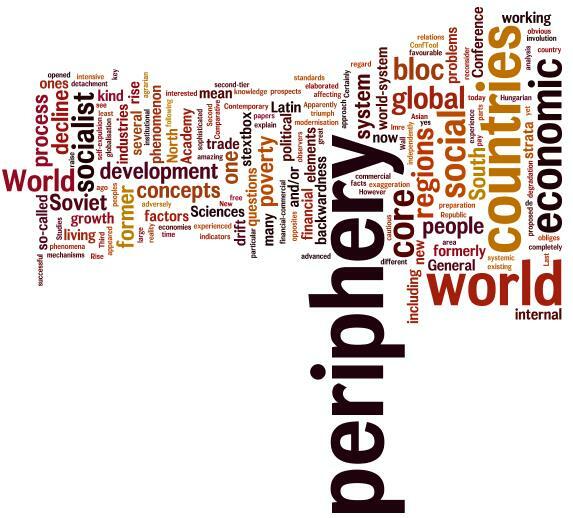 The concepts of periphery and core (centre) have been the key elements of the world-system analysis and development studies since the mid-20th century. Apparently, periphery and core emerged and co-evolved as opposites inseparable from each other. Their unity is rooted in the asymmetrical dependency of peripheral countries on the world-system core. Originally, these concepts were elaborated in a framework of some kind of “economistic” (circulation-centred) vision and seen as systemic elements of trade relations between the rich, industrial North, and the poor, agrarian South (H. Singer, D. Seers, R. Prebisch, A. Emmanuel, A. Pinto, I. Wallerstein). S. Amin, not rejecting such an approach to the periphery-core problems completely, focused on the process of material production and differences in labour skills between the economies of the North and the South. At the recent time, the process of globalisation as well as the growth of the South obliges us to reconsider some general and widely accepted concepts, including the ones of periphery and core. In particular, it is relevant to put the following questions: what does pertinence to the world periphery mean today? What are the criteria and/or indicators which would duly show one or another country’s drift to or from the world periphery? 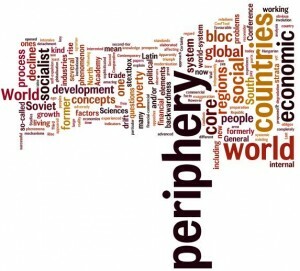 Can the world core exist without periphery, and if yes, to what extent? Does non-inclusion into the global financial-commercial and economic system mean complete detachment from the world periphery? Can periphery extend independently from the global commercial and financial sub-systems? Where does the economic growth of failed and semi-failed states really arrive at? What are the social, economic and political factors favourable for self-exclusion (self-expulsion) of some countries from the world system? The fall of the Berlin Wall and the collapse of the “socialist” Soviet bloc opened way, as it appeared to many observers and common people, to the triumph of democracy and free market economy on a global scale. However, reality became somewhat different. Only few territories/regions of the former Soviet bloc experienced genuinely positive changes in their economic, social and political life. On the contrary, a vast majority of the formerly “socialist” countries’ peoples had to face a shocking decline of their standards of living and lost several social benefits/guarantees that were available for the working people in the past. Technically sophisticated, medium- and high-tech (“knowledge intensive”) industries degraded. Countries of the so-called formerly “socialist community” (the Second World) can now be categorised (with some kind of exaggeration) as underdeveloped and backward, as the Third World was 40 years ago. How can we explain this phenomenon of large-scale decline and degradation? What are the social and economic and/or institutional factors or mechanisms of this great failure? Are there some chances for countries of the former “socialist bloc” to improve their positions in the world system? Certainly, the rise of a new periphery is observable not only in the ex-USSR. While some countries and regions surmount obstacles to development more or less successfully, several other regions experience an evident process of involution (decline) or, at best, stagnation. With regard to the fascinating phenomena of modernisation in the People’s Republic of China, or to the amazing successes of high-tech/software industries in India, one should be cautious and pay attention also to the large geographical regions and social strata of backwardness in these gigantic countries. Even some “tigers”, mainly the second-tier ones, such as Malaysia, Thailand and Indonesia, did not yet abolish the internal periphery where most of the people are living below the official poverty line. These facts raise doubt on the strength and longevity of the so-called East Asian “miracles”. The regions and strata in permanent poverty and backwardness continue existing in Latin America, although the Left and Left-centrist governments in many Latin American countries apply non-ordinary and relatively successful efforts to overcome poverty. Last but not least, one can see an extension of the internal periphery in certain parts of the advanced, “First World” countries, including the US and UK. This phenomenon is adversely affecting the global economic, trade and financial situation and development as a whole. Meanwhile, it is the area of the former Soviet bloc which is now appearing as the world “champion” by pace and depth of the obvious drift to the periphery. All these questions and problems will be considered for long-term research prospects, and the General Conference gives a good opportunity for such discussion. We ask to submit the abstracts of the proposed papers until November 28, 2013, according to the preparation schedule of the conference (Bonn, 23-26 June, 2014).